I was at a workout the other day and noticed that a recent high school graduate was shooting with a strange looking ball. It had a completely different color, texture, and weight than the Nike ball I was using. It was darker, rougher, and harder. It was made by Under Armour. Apparently the school this guy is attending uses those balls exclusively. I couldn’t believe it. Not only was I unaware that Under Armour even made basketballs, I was shocked that they had the audacity to trot out what I consider an obviously sub-par product. Unless you are 100% defensive minded, I am pretty sure you prefer a ball with some give and cushion to it. A relatively soft, slightly sticky ball is easier to handle and allows you a little more leeway with your shots that hit the rim. By making a tough, unforgiving ball, Under Armour essentially ignored all the traditional qualities that people seek out in a college ball. It had the look and feel of something a Middle School team would use when if were forced to practice outside. Stick to cleats, Under Armour. Seeing Under Armour’s poorly made, make-James Naismith-Roll-Over-In-His-Grave ball reminded me of the least favorite basketball I have ever used. Lots of bad memories coming back right now. If you want a ball that can stand up to daily outdoor use during a Canadian winter, The Rock might come in handy. Barring that, I advise you to stay far away from this ball. The one thing it has going for it is that it is aptly named. 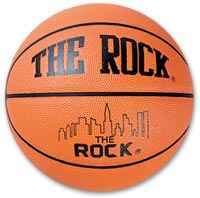 I don’t know what the hell a T-1000 is (Spalding), or what makes a ball Elite (Nike), but I know why this thing is called The Rock. It is as hard as passing a driving test blindfolded. You could replace wrecking balls with Rock’s and the crew might not notice for half a day. Team’s practice with gloves on when they first start using them. Coaches of Rock affiliated teams have nightmares where their best player tries to catch a chest pass and shatters all his sesamoid bones. The Rock is abrasive, unwieldy and ugly. It hurts to use it in a cold gym. It features a lame, half-assed depiction of what I think is the NYC skyline. No one was clamoring for a ball with artwork on it. It is garish and distracting. How did this abomination ever even break into the marketplace? Was there a billionaire in the Northeast who thought it would be a fun challenge to create the least user friendly basketball imaginable, just to see if he could get teams to use it? If so, bravo unknown billionaire. You did it. Hundreds of players across the country are dealing with this monstrosity. Now please, pull this thing from the market and end the suffering. What I’ve realized is that it is silly to direct my anger at the bored billionaire who conceived The Rock. The real culprit is the NCAA, who refuses to make every team use one ball. I don’t see why they can’t gather all the coaches, vote on a ball, and call it a day. The Rock would get maybe one or two votes from some Tom Izzo acolytes who want to do rebounding drills all practice. The normal people would vote for Spalding, Wilson, or Nike and the matter would be settled. There is probably some economic reason as to why the ensuing ball monopoly would be unfair. Maybe it would be better if the NCAA came up with extremely strict parameters within which the balls had to be constructed. As long as the balls you chose to use fell into those guidelines, you could do as you pleased. Go ahead and use balls made by Frito-Lay if they’ll give you the most money. I am pretty sure that there would be an uproar if there was as big a discrepancy between balls in college football or baseball as the one that exists in basketball. Imagine if one baseball team had a ball with different seams, as well as extra ridges and grooves. People would freak out, and rightfully so. It sounds like a petty complaint, but in my opinion the type of ball used can make a big difference. Even going from one soft synthetic composite leather ball to another would take me a little getting used to. If every team used the same ball then that adjustment period would go away, and you might even see improved shooting percentages. I just don’t see a downside in standardizing the balls. It’s not like you can choose to have a farther three point line, or to extend your sidelines by 5 feet. Making everyone use one type of ball might not make a noticeable difference for the fans, but I think the players would really appreciate it. Even better would be if every basketball league, in every country and at every level, used one ball. That would be my ideal world. It’s just plain strange that there is so much variation. If we look at a guy like Anthony Davis, the number one pick in this years draft, we can see how having multiple balls with untold numbers of styles and designs can affect someone. Davis went from using a soft synthetic leather Nike ball at Kentucky, to a hard leather NBA ball during his pre-draft workouts, to the bizarre, paneled Molten ball that is used in international play. What if college film students were forced to shoot in 8 mm, Hollywood studios exclusively used digital cameras, and crazy artsy French directors insisted on using antique kodaks and then splicing together the images. Actually, no one would really care. But you get the point. It would be dumb. There are definitely other things that can be done with basketball as a whole that are more important than standardizing the balls. It would be great if there were less timeouts, less incentive to tank in the NBA, and more all out brawls between fans and players (just kidding with the last one.) I also can’t wait until there are robot referees that never make bad calls. Flopping would cease to exist, and fans everywhere would rejoice. It will probably take long time for those types of things changes to come to fruition, so in the meantime I say we set our sights on making every ball the same texture, size and weight. I hope to be in the general vicinity of a team that routinely had to play with The Rock when the standardization verdict comes down. Being a part of the first cathartic Rock bonfires will surely be an experience on par with pulling down the statue of Saddam Hussein, or witnessing the fall of the Berlin Wall. I can’t wait. You could not be more wrong about the characteristics of the Rock. If anything it is too soft and mushy, and when it first comes out of the packaging it is sticky. It would not last 10 mins outdoors. There is also an outdoors Rock that is made of some hard plasticy rubber material. Perhaps you are confusing these different balls. The Rock got its start in AAU basketball in the Northeast (e.g., it is the official ball of the Lightning AAU franchise). It infiltrated college basketball through coaches contracts and by providing balls to high end recruitment events.